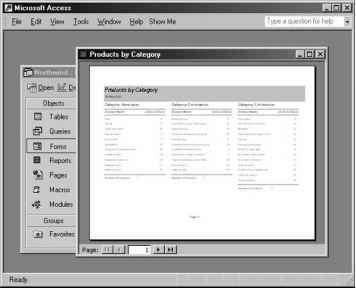 You can open a Microsoft Access form from Microsoft Excel. You can also create a new form. 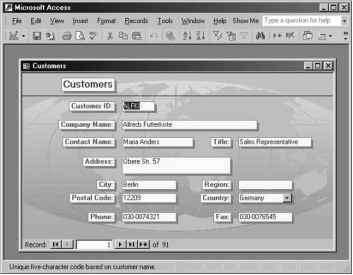 The following example uses Automation to connect to Microsoft Access. Once the connection is established, the OpenCurrent-Database method is used to open the sample Northwind database. Next, the Customers form is opened with the OpenForm method of the DoCmd object. The form is opened in the normal view (acNormal). To display the form in the design view, use the acDesign constant instead. The Restore method of the DoCmd object ensures that the form is displayed on the screen in a window and not minimized. The Visible property of the Access Application object (objAccess) must be set to True for the form to become visible. Notice that the Access.Application object variable (objAccess) is declared at the top of the module. For this procedure to work correctly, you must set up a reference to the Microsoft Access Object Library. Figure 15-8 shows the Customers form after it's been opened. & "Office\Samples\Northwind.mdb" strFrm = "Customers"
Figure 15-8: A Microsoft Access form can be opened by an Excel VBA procedure. Figure 15-9: An Access form can be created by an Excel VBA procedure (see the code of the CreateAccessForm procedure shown above). 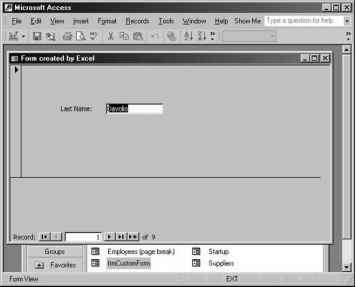 How to open excel vba form in ms access?